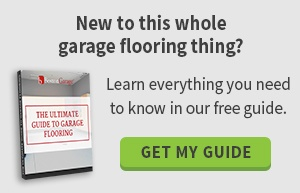 Where Will My Unprotected Garage Floor Be In One Year From Now? 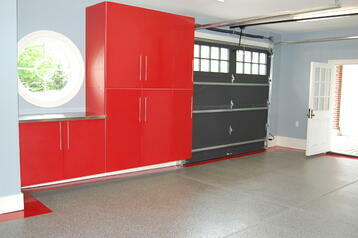 The Leader in Garage Flooring & Garage Storage Cabinets in Boston, MA, CT, NH & RI. I feel bad for garage floors. Having four thousand pound vehicles driving over it multiple times per day, hot tires, grease, oil, road salt, dirt, and sand, it must be the most abused place in any home. When your home builder poured the concrete for your garage, the goal was to provide a durable and smooth surface, however, concrete is a porous surface that absorbs all of the aforementioned contaminants that can degrade the concrete in time. Unprotected concrete exposed to these elements can deteriorate at a greater rate than a sealed and coated floor. This deterioration can come from surface wear through dry attrition, which results from traffic on the exposed surface, as well as erosion resulting from absorption of harmful contaminants. This deterioration process starts from the surface and can work through the concrete. Lets talk about the benefits of protecting your garage, and there are many! Safety is a factor no matter what you use your garage for, whether it is to park the car, as a workshop or as storage. As mentioned, concrete is porous and these harmful contaminants seep in creating an unpleasant and potential dangerous odor and environment. Let’s not forget the slipping factor; especially here in New England where we can get snow six months out of the year that melts into a slippery slush and then we can get months of rain, weather here is unpredictable. No one wants a slippery, dangerous garage! Another benefit is longevity. An unsealed garage is screaming for cracks. Again, we live in New England, the temperatures vastly fluctuate, allowing the concrete to expand and shrink, therefore leaving cracks that will not get smaller but larger with time! Some are just surface cracks and others permeate through the entire depth of the concrete. Before coating the surface, restoration and repair of the cracks must be done using the proper tools and materials to ensure long term stability. If these cracks are not dealt with they can continue to enlarge and degrade the surrounding concrete. Not to mention, the garage is another space in our home, it is an extension of our most expensive and prized possession that we will own for a very long time. It should be treated and cared for just as we would the flooring inside the home. Let’s not forget the aesthetics aspect of our garage as previously mentioned, it is an extension of our home. No one wants to see oil stains or cracks, they are aesthetically unpleasing to the eye. You could paint the garage but this is just a quick, temporary fix that will end up costing more money in the long run -paint peels! We use a hybrid polymer composition – what does this translate to? When installed correctly, it looks great, is easy to clean, provides ultimate durability, it permanently bonds to the concrete, is UV stable, it can provide a safe, non slip surface and is available in hundreds of colors and flake combinations making it aesthetically pleasing to even the most discerning eye. Lastly and certainly not least, it is cost effective! 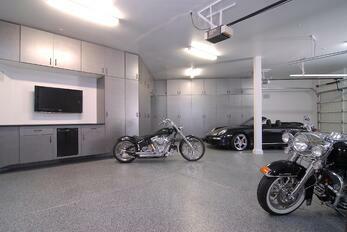 We are Massachusetts' leader in garage interior enhancement serving the Boston, Concord and Providence areas. We post weekly articles about the latest and greatest in all things garage improvement.